Patch 3.1 brings the Argent Tournament, a new world event featuring mounted combat, new daily quests, new mounts, pets, tabards, and new and interesting ways to get reputation. Read on for a guide to the Argent Tournament! Caveat: This guide is based on the quest chains in build 9658 (current as of March 13th 2009); the devs have been actively adjusting this event, so some details may be different when it goes live. I will keep it as up to date as I can, however! So! You’ve acquired your 15 Aspirant’s Seals and you’re keen to qualify as a Valiant of your faction? Read on! Hand those 15 seals in to your faction’s leader – Arcanist Taelis for the Silver Covenant, Magister Edien Sunhollow for the Sunreavers – to complete Up to the Challenge. The leader will give you a new quest, The Aspirant’s Challenge. This quest asks you to equip your lance, mount up and ride to the Aspirant’s Ring (location B on the map below). Be warned: this fight is not easy. You need a good grasp of your mount’s abilities and decent decision-making on the fly about what to use when. In a way, it’s like very slow-paced PvP (only with a character whose abilities you’re barely familiar with). That said, it’s not necessarily hard, either: it’s just not a straightforward ‘easy win’ like most PvE quests. If you fail, you can keep calling for an opponent until you win, so you don’t have to spend another three days getting more seals to try again. Have your Defend at three stacks before you start the fight, and keep it up during the fight as he Charges or Shield-Breakers you. Rather than messing about with manoeuvering, let the Valiant be the one to get range – periodically he’ll back off; be ready to Charge him as soon as he’s at range. This is essential, else he’ll Charge you instead. Make sure if he’s backing off you keep your GCD clear; don’t try and be clever and throw a Shield-Breaker, you won’t have time. Once you’ve charged him, wheel around for some melee Thrusts, and while you’re wheeling throw a Shield-Breaker or two to keep his Defend stacks down. At present, you can be assisted on this challenge by a friend who attacks the Valiant once you’ve engaged. This may be disabled once it goes live, if Blizzard want this to be a truly solo affair. If it remains an option, it’s best if your friend keeps at range and uses Shield-Breaker and Charge repeatedly to keep the Valiant’s Defend stacks at nil. The Valiant will consistently attack you, so your assistant will have a much better chance to keep at range than you will. Note: apparently this fight has yet to be tuned, and may change in difficulty. Once you’ve beaten the Valiant, return to your faction’s leader and hand in the quest. You’ll be offered the quest A Valiant of [City], depending on your character’s racial home. This quest sends you to talk to the leader of your city’s delegation, who’ll enter you into the tournament on your city’s behalf. Go and talk to your city delegation, who are based in the same pavilion. Congratulations! You’re a Valiant! Each city has four NPCs in its delegation: a Grand Champion, a Master of Arms, and a Master of Horses (or Rams, Nightsabers, Chocobos, et cetera), who all give quests, and a Quartermaster who sells items purchasable with Champion’s Seals. The Grand Champion gives you The Valiant’s Charge, which is the quest to acquire 25 Valiant’s Seals and pass the test for Champion rank. He or she also gives you one of A Blade Fit For A Champion, A Worthy Weapon, or The Edge of Winter; these are the same dailies you did as an Aspirant, although they now reward 2 Valiant’s Seals instead of 2 Aspirant’s Seals. The Master of Arms offers you the daily A Valiant’s Field Training to kill Scourge in Icecrown, which rewards 1 Valiant’s Seal. The Master of Horses/Rams/Whatever offers two dailies: At the Enemy’s Gates (worth 1 Valiant’s Seal) and The Grand Melee (worth 1 Valiant’s Seal). This quest sends you to the Argent Crusade forward camp at Corp’rethar, where there’s a Stabled Campaign Warhorse for you to mount. This mount has the same four basic abilities as the Tournament mounts; it lacks a heal of any type, and a duel ability. My thanks to Quirell of Gnomeregan, who was a very friendly and informative questing buddy when I was learning about this area. Near the camp, there are formations of Scourge Boneguard forces; these are elite undead mobs that interact with your mount’s abilities in various ways. This area is also the focus of a similar, harder daily at the Champion level. These are flying gargoyle mobs; their spell attacks strip away Defend stacks. Kill them with ranged Shield-Breaker attacks; it should take two hits to kill one. These are skeletal soldiers; they’re grist for the mill. Run over them on your mount and they die, literally. These are mounted fighters. They’re vulnerable to melee attacks; they do use Defend, but they don’t reapply it. Just use your Thrust to beat them down. This is the other significantly new daily, compared with the Aspirant’s dailies, and requires you to mount up and challenge and defeat three Valiants. You need to do this in your faction’s Valiants’ Ring – C or D on the map above. You can challenge Valiants from each city, and they use different strategies depending on their race. Draenei: run slowly. Don’t melee them; kite with Shield-Breaker with occasional Charges. Dwarves: try and burn their defense down as quick as possible, then get in a Thrust before they reapply Defend. Slow and tedious. Gnomes: are fairly balanced, much like the Valiant you fight to be promoted from Aspirant. Keep Defend up, stay in melee range, use occasional range to throw Shield-Breaker. Humans: have an anti-Charge ability, but are ‘unbalanced’ by Shield-Breaker. Throw a Shield-Breaker to unbalance them, then Charge before they get back to normal. Otherwise, stay close. Night Elves: stay in melee to stop them using their superpowered Shield-Breaker. Keep Defenses up and Thrust them down. Note that Horde has equivalents of each of these, but I’m not sure on the pairings yet. Also, for Alliance, there’s a good write-up of the differences at this WoWwiki page. Each faction only has 2 Valiants; if both are on the field, it seems that you have to wait for them to win or loseWeight Exercise before you can challenge them. I foresee a lot of people helping each other to get the matches over faster, to free up the popular Valiant types faster. That said, I’ve heard that this content has yet to be tuned, and right now the Valiants might just be harder than Blizzard wants. If not, though, you can expect co-operation to be the order of the day, because most people just won’t want to spend hours failing on solo content. My feelings are mixed. On the one hand, I like the mechanics, the level of detail, the setting, the concept. On the other hand, this is the kind of content I’m not particularly good at – twitchy, highly-mobile, PvP-like stuff reliant on positional advantage and excellent skill use. On a personal level, I’ll doubtless play the Argent Tournament content, but if it takes as long as I expect to get decent at the combat, I’m honestly not sure how much I’ll enjoy it. Things are changing pretty fast for paladins at the moment. This is nothing like the huge revamp in 3.0.2, but there’s a lot to adjust to anyway. From MMO-Champion, an update to the official patch notes and a list of undocumented changes. Divine Plea can once again be dispelled. Exorcism: Now can be used on any target and has a 100% chance to be a critical strike when used on Undead and Demons. Shield of Righteousness: Base damage and scaling factor increased by 30%. Spiritual Attunement: Removed from trainers. It is now available deep in the Protection tree for 2 ranks at 5/10%. The Exorcism change is a nice one; it helps normalise paladin damage, and gives Holy paladins in particular a bit more oomph in solo content. The Shield of Righteousness change is a straight buff, so woot for that. The Spiritual Attunement change, on the other hand, is extremely disappointing. Now you will have to be Protection to tank anything; no more tanking as Holy in Prot gear. I can understand why they didn’t want non-tanking paladins to have access to Spiritual Attunement, to help control our mana, but it really detracts from our nature as a hybrid if we have to spec Prot to tank anything. Rohan over at Blessing of Kings has an excellent post on the issue: Will the Last Hybrid Paladin Please Turn Off the Lights? which includes a couple of much more elegant ways of restricting access to Spiritual Attunement. Judgements of the Pure was moved from Tier 10 to Tier 9. Sacred Cleansing was moved from Tier 9 to Tier 8. Enlightened Judgements was moved from Tier 9 to Tier 10. Infusion of Light was moved from Tier 8 to Tier 10. Aura Mastery now causes your Concentration Aura to make all affected targets immune to Silence and Interrupt effects and improve the effect of all other auras by 100%. Blessed Hands: Now reduces mana cost of Hand of Freedom, Sacrifice and Salvation by 15/30%, and improves the effectiveness of Hand of Salvation by 50/100% and Hand of Sacrifice by an additional 5/10%. Moved to Tier 4. Pure of Heart: Now reduces duration of all curse, disease, and poison effects by 15/30%. Purifying Power: Now reduces the cooldowns of Exorcism and Holy Wrath by 17/33% instead of increasing critical strike chance. The talent shifts are a little confusing to read like that; click the image on the right to see how the tree actually looks. (Please ignore the slightly dodgy spec; I was just picking up Aura Mastery to test it out.) For the classic 51-point PvE builds, it’s still perfectly straightforward to get all the abilities you need. The Blessed Hands change is a nice buff; it previously reduced mana cost and increased dispel resistance for all hands. It’s worth noting that the new version provides no benefit for Hand of Protection, but the other changes are useful both for PvP and PvE. It’s actually a viable alternative to Imp BoWis or Imp Lay on Hands now. Greater Blessing of Sanctuary now gives the target 2% of maximum displayed mana when the target blocks, parries, or dodges a melee attack. Guarded by the Light got an additional effect – In addition, your Divine Plea spell is 50/100% less likely to be dispelled. Ardent Defender: Reduced to 3 ranks for 10/20/30%. Avenger’s Shield: Base damage and scaling factor increased by 30%. Blessing of Sanctuary: Now only grants mana on dodge/parry/block. In addition, will only grant mana if that is the active power type of the friendly target (Bears and Cats won’t gain mana). 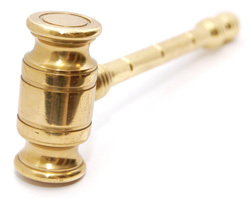 Improved Hammer of Justice: Reduced to 2 ranks for 10/20-second cooldown reduction. Holy Shield: Base damage and scaling factor increased by 30%. Judgements of the Just: Now also reduces the cooldown of Hammer of Justice by 10/20 seconds, and increases the duration of the Seal of Justice stun effect by .5/1 second. One-Handed Weapon Specialization: Reduced to 3 ranks for 4/7/10%. Shield of the Templar: No longer increases the damage done by Holy Shield, Avenger’s Shield, and Shield of Righteousness. Now grants 33/66/100% chance to silence your Avenger’s Shield targets for 3 seconds. From a healer perspective, most of these changes won’t make a significant difference. The change to Imp Hammer of Justice will affect 51/20 PvP specs slightly, but that’s about it. From a tank’s perspective, I don’t have current enough knowledge of Protection to talk intelligently about these changes, unfortunately. Clearly I need to spec Prot for a week and go Heroic my face off! Sanctified Seals was renamed to Sanctity of Battle, now Increases your chance to critically hit with all spells and attacks by 1/2/3% and increases the damage caused by Exorcism and Crusader Strike by 5/10/15%. Divine Purpose: Moved to Improved Retribution Aura’s position. Improved Retribution Aura: This talent has been removed. Swift Retribution: Now grants its haste bonus while any aura is active. None of these changes significantly impact Holy; they’re a step towards slimming Ret down (although I didn’t think Ret was particularly bloated in the first place, to be honest). Of note, I’d seen some concern about Sanctity of Battle no longer adding to healing spell crit. I’ve checked on the PTR and it does still affect spell crit, and the crit part of the talent is worded exactly the same as Sanctified Seals, so this appears to be intentional. I’ve edited some details in of the Argent Tournament on the live servers; some details may still be old, but the bulk is current. 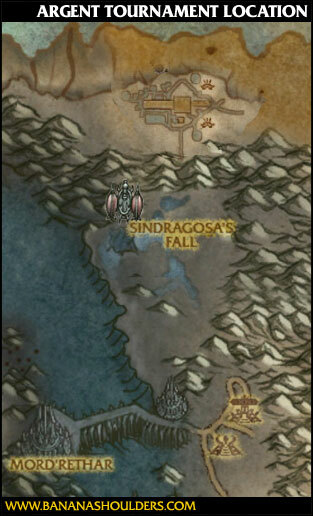 The Argent Tournament is located in Icecrown, in the north-east of the zone, north of Sindragosa’s Fall. 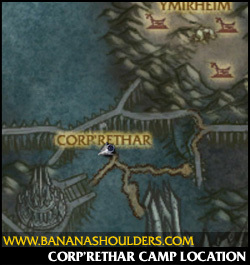 The site is home to inns, mailboxes, a flightmaster, profession trainers for every tradeskill, and a host of questgivers. There are storyline quests in the area, and dailies with pure cash rewards, but what sets the Argent Tournament apart is the new system of mounted combat with a quasi-feudal rank structure associated with it. When you begin working on the mounted combat quests, you’re called an Aspirant of your race’s faction – a Stormwind Aspirant, Orgrimmar Aspirant, et cetera. You earn Aspirant’s Seals from the quests you’re offered at this level. Once you’ve completed enough tasks as an Aspirant (i.e. accrued 15 Aspirant’s Seals), you can pass a test to become a Valiant of your race, and further, more complex tasks open up. These earn Valiant’s Seals. Once you’ve completed Valiant training (i.e. accrued 25 Valiant’s Seals), you can take the challenge to become a Champion of your race; if you’re as fast as possible you can go from Aspirant to Champion in ten days. The Black Knight questline gives Argent Crusade reputation. The mounted combat quests give Silver Covenant reputation for Alliance and Sunreaver reputation for Horde. There are a number of new achievements introduced for the Argent Tournament. Tilted! : Defeat another player in a mounted duel at the Argent Tournament. It’s Just a Flesh Wound: Unmask and defeat the Black Knight at the Argent Tournament. Argent Aspiration: Train to compete in the Argent Tournament by becoming an Aspirant for your race’s faction. Argent Valor: Train to compete in the Argent Tournament by becoming a Valiant for your race’s faction. Champion of Darnassus: Earn the right to represent Darnassus in the Argent Tournament. Exalted Champion of Darnassus: Earn Exalted status with and the right to represent Darnassus in the Argent Tournament. Champion of Exodar: Earn the right to represent Exodar in the Argent Tournament. Exalted Champion of Exodar : Earn Exalted status with and the right to represent Exodar in the Argent Tournament. Champion of Gnomeregan: Earn the right to represent Gnomeregan in the Argent Tournament. Exalted Champion of Gnomeregan: Earn Exalted status with and the right to represent Gnomeregan in the Argent Tournament. Exalted Champion of Ironforge: Earn Exalted status with and the right to represent Ironforge in the Argent Tournament. Champion of Ironforge : Earn the right to represent Ironforge in the Argent Tournament. Exalted Champion of Stormwind: Earn Exalted status with and the right to represent Stormwind in the Argent Tournament. Champion of the Alliance: Earn the right to represent every Alliance race’s faction in the Argent Tournament. Exalted Champion of the Alliance: Earn Exalted status with and the right to represent every Alliance race’s faction in the Argent Tournament. There are, of course, equivalent Horde achievements. The layout below shows the location of important places and NPCs. When you enter, you want to head to the Argent Pavilion first, where you’ll speak to Justicar Mariel Trueheart. She’ll give you a link quest to speak to an NPC in the Silver Covenant Pavilion (if you’re Alliance) or Sunreaver Pavilion (if you’re Horde). She also gives you a link quest to talk to the Blastbolt brothers, goblins who give daily quests. So, head to your faction’s pavilion and talk to the main questgiver. For Alliance, it’s Arcanist Taelis; for Horde it’s … well, I can’t tell you, because you get teleported out of the opposing-faction’s pavilion if you try and enter. So I’ll be looking at the Alliance-side quests, but the Horde side should be equivalent. In the Silver Covenant Pavilion, Arcanist Taelis gives you the Mastery of Melee quest. Near Arcanist Taelis there’s Avareth Swiftstrike and Scout Shalyndria, who give you Mastery of the Charge and Mastery of the Shield-Bearer respectively. Each of these three quests require you to equip a lance, mount a steed outside the pavilion, talk to an NPC near the Aspirants’ Ring (see ‘B’ on the map above) and go attack one of the melee targets using one of your special mounted abilities – Thrust, Charge and Shield-Breaker respectively. These quests will show you how to use the mounts and their abilities. Once you’ve completed these three quests, Arcanist Taelis offers you one of three dailies: A Blade Fit For A Champion, A Worthy Weapon, or The Edge of Winter; Avareth Swiftstrike offers you Training in the Field (a daily), and Scout Shalyndria offers you Learning the Reins (also a daily). Between them they offer 5 Aspirant’s Seals. Thrust – a melee attack (6 yard range, 2 sec cooldown) that inflicts 3250 damage. Shield-Breaker – a ranged attack (5-30 yard range, 2 sec cooldown) that inflicts 2000 and reduces the opponent’s defenses. Charge – a charge (8-25 yard range, 6 sec cooldown) that inflicts 8500 damage and reduces the opponent’s defense. Defend – a defensive ability (self-cast, 4 sec cooldown) that reduces damage taken by 30%, and can be stacked up to three times. One charge of Defend is removed by an opponent’s Shield-Breaker or Charge. Refresh Mount – heals your mount to full health (self-cast, 1 min cooldown), can only be used out of combat. Duel – challenges another combatant to a duel. The green “bottle” on the left of the mount bar is your mount’s health meter. The black bottle on the right is … apparently nothing, perhaps decorative (or not yet implemented). The mounted combat is fun and well-implemented; I haven’t encountered any bugs yet. The Aspirant quests are excellent when it comes to explaining new abilities and teaching you how to use them. If anything, at this stage of play the Tournament’s biggest flaw is a lack of content. There are only a few repeatable quests, and it takes four days to reach Valiant status. I’m finding the experience and environment fun enough that I wish there were more quests to do – not necessarily to get to Valiant faster, but just so that I don’t have to run out of fun things to do. The usual caveat: all of this is subject to change before 3.1 goes live. 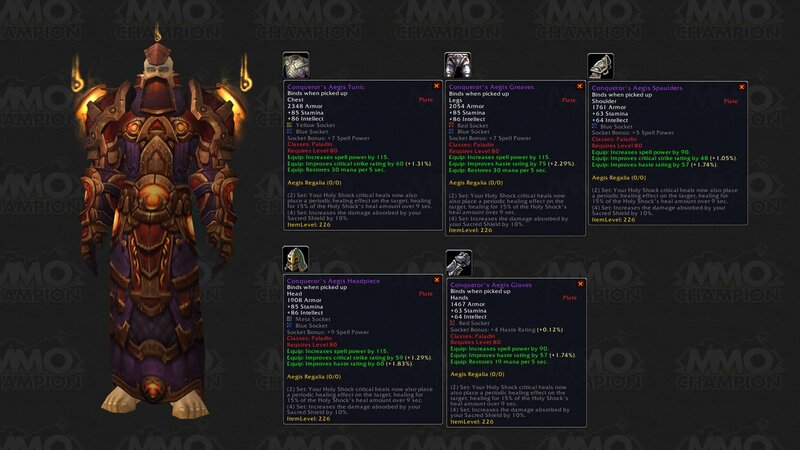 If you watched the progress of class changes in the WotLK beta, you’ll know just how much something can change during the testing process. This is from Build 9658 of the 3.1 PTR. All paladins auras had their range extended from 30 yards to 40 yards. Thank God. Along with Blessing of Kings being baseline, this is one change where we can all say “It’s about time”. On the other hand, now Holy needs an 11-point talent. Sacred Shield now cannot be on more than one target at any one time. This change was implemented because Sacred Shield was doing “too much” damage prevention in Ulduar. Infusion of Light no longer has a chance to reduce the casting time of Holy Light, but increases the the critical chance of your next Holy Light by 10/20% instead. No word on why this change was made, but I’m hoping it doesn’t stick, personally. Hand of Sacrifice now lasts 12 sec or until the caster has transfered 100% of their maximum health. A PvP limitation; I don’t think HoS gets used as much as it should in PvE content anyway. A nice change. Not unbalancing, I think, just making life a bit easier. Divine Sacrifice *New Talent* (Tier 3) – 30% of all damage taken by party or raid members within 30 yards is redirected to the Paladin (up to a maximum of 150% of the Paladin’s health). Instant, 2 min cooldown. Well, protection paladins finally got their 11-point talent. You can see some of their discussions in this Maintankadin thread. Just like a priest’s Mass Dispel, that’s bye-bye bubble. Be wary of warriors wielding only one weapon! Judgements: they’re not just for Retribution paladins any more. There’s a fair amount of misinformation and misunderstanding floating around when it comes to paladin Judgements, and the issue of “who should Judge? when? why?” is something I’ve seen come up in discussion in a number of places recently, so: here’s a guide. First up is the primer; if you know the basics, skip to the end for the last three sections. You have to have a Seal spell currently active before you can cast a Judgement. There are three Judgement spell options, which share the same cooldown: Judgement of Light, Judgement of Wisdom and Judgement of Justice. Using a Judgement spell has three effects: damage, a debuff on the target, and a buff to you (and possibly others). The damage from Judging each seal scales differently with talents and stats; going into detail is outside the scope of this guide. The Judgement spells all apply a different debuff to the target. You generally can’t stack more than one debuff of each type on a single target, regardless of how many paladins are judging – this has not always been the case, but that’s usually due to bugs. Each debuff lasts 20 seconds, so a paladin will need to keep re-judging to keep the debuff up. Judgement of Light applies a debuff to the target which has a chance to restore health to anyone who hits the target. This healing is attributed to the paladin who applied the judgement, and confers zero threat. The amount of healing it gives scales with the gear of the judging paladin; the amount is calculated by (0.18 * AP) + (0.18 * SP). Therefore, if you’re fighting with multiple paladins, this should be applied by the people with the highest combined attack power and spellpower. Judgement of Wisdom applies a debuff to the target which has a chance to restore mana to anyone who hits the target. This is a flat amount; 2% of the attacker’s base mana, so it doesn’t scale with the paladin’s gear, the attacker’s gear, or anyone else’s. Judgement of Justice applies a debuff that stops the target from fleeing, and restricts their movement speed. Used against mobs, this spell will stop them from running away at low health if they would normally do that. Used against players, this spell restricts people to 100% speed – ie, standard running speed. It nullifies speed increases from mounts, gear (ie enchants and gems), skills (like Dash/Sprint) or talents (like Pursuit of Justice or Unholy Aura). PvP trinkets will remove this effect, but druid shapeshifting won’t – for obvious reasons, this is a popular judgement in PvP, especially in arenas. 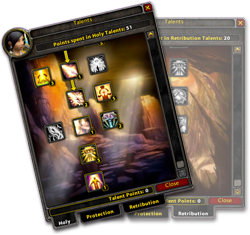 Each paladin talent tree has a talent that synergises with the use of your Judgement spells; the effects of these are very different, depending on your spec, but all are useful. Holy paladins have the Judgements of the Pure talent, which increases their Haste by 15% for one minute after using a Judgement. This is very useful for healing; you only need to judge once a minute to keep this buff up, and the Haste can make a big difference in your healing output. Protection paladins have the Judgements of the Just talent, which is technically a further debuff to the Judgement target: it reduces the target’s melee attack speed by 20%. This is a huge bonus when fighting opponents that do a lot of physical damage (like, say, most raid bosses); it’s a lot of incoming damage that the tank no longer has to soak or avoid, a lot of damage that the healers no longer have to heal. Retribution paladins have the Judgements of the Wise talent, which restores 15% of their base mana immediately, and grants the Replenishment mana restoration buff to the raid. This talent makes Retribution paladins very useful to most raid groups. Paladins are pretty popular these days, which means many (I dare say most) raid groups will have more than one – which means you should be sharing the Judgement duties around, or else people are going to overwrite each other and waste useful abilities. Judgement of Light is currently more useful than Judgement of Wisdom, because mana isn’t a problem for most people in current content. That may change – is likely to, in fact – in Ulduar, so raid groups in the future will need to revisit this issue. But for now, if you’ve only got one paladin, Judgement of Light is more useful than Judgement of Wisdom. And Judgement of Justice is useful only for the sake of triggering your talents; the debuff it confers doesn’t do anything useful. So, in current content: Light > Wisdom > Justice. Judgement of Light scales equally with Spellpower and Attack Power. Ret paladins should be applying this if they’re present, as a Retribution Paladin’s AP + SP total will be higher than that of other specs. Protection paladins are next on the list; Holy paladins should only be applying this if there are no other paladin specs in the raid. 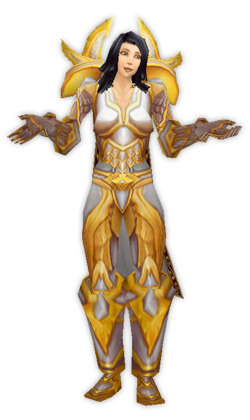 If there is a Protection paladin in the raid, they should not have their judgements overwritten, except by another Prot paladin – this is important, in order to keep Judgements of the Just active. Holy paladins can apply whatever Judgement isn’t already claimed by another spec, as they only need to judge once a minute for Judgements of the Pure; their judgement doesn’t have to stay up. Ret, Prot and Holy: Ret on Judgement of Light, Prot on Judgement of Wisdom, Holy on Judgement of Justice. Ret and Prot: Ret on Judgement of Light, Prot on Judgement of Wisdom. Ret and Holy: Ret on Judgement of Light, Holy on Judgement of Wisdom. Prot and Holy: Prot on Judgement of Light, Holy on Judgement of Wisdom. If all your group’s paladins are of the same spec, it doesn’t really matter who judges what. 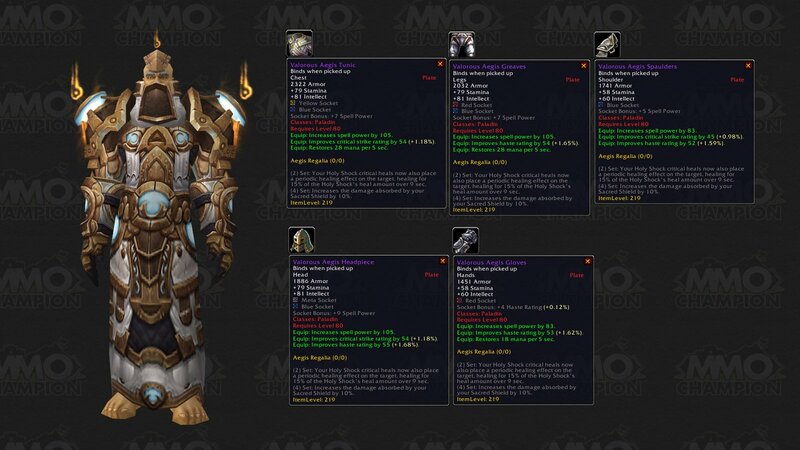 The best-geared paladin should judge Light, as it scales with gear, but it doesn’t really matter. … But What About The Meters?! There are holy paladins out there who will claim they should be judging Light so they get credit for all that healing done on the meters. There are raid leaders out there who look at healing meters and get angry if the Retribution paladin is nearly outhealing the Holy paladin. To both of you, I say: fie on you! Healing is not a competition; the raid group is a team. Do you really want to give bad assignments that waste peoples’ potential, just so the meters look “right”? If you’re that concerned about the meters, log the raid with WoW Webstats (aka WWS), look at the report afterwards, and ignore the amounts for Judgement of Light. Don’t let Meter Worry (or Meter Pride) goad you into encouraging the use of inappropriate Judgements, when in the right hands Judgements are powerful tools for your raid. 3.1 Paladin Info: New Glyphs and New Gear! The deluge of information from the 3.1 PTR has begun! Glyph of Beacon of Light *new* — Increases the duration of Beacon of Light by 30 sec. Glyph of Hammer of the Righteous *new* — Your Hammer of the Righteous hits 1 additional target. Glyph of Divine Storm *new* — Your Divine Storm now heals for an additional 15% of the damage it causes. Glyph of Shield of Righteousness *new* — Reduces the mana cost of Shield of Righteousness by 1 to 6%. Glyph of Divine Plea *new* — While Divine Plea is active, you take 3% reduced damage from all sources. Glyph of Holy Shock *new* — Reduces the cooldown of Holy Shock by 1 sec. Glyph of Hand of Salvation *new* — When you cast Hand of Salvation on yourself, it also reduces damage taken by 20%. I need to do more than hasty napkin math, but these items look to be to be inferior to what I consider current best-in-slot – Waistguard of Divine Grace and Poignant Sabatons, both from Naxx-25, so I wouldn’t bother saving mats for them if you’re doing 25-man raids. For the first time ever, it looks like there’s a legendary that’s usable by – and of interest to – us healing paladins! The Fragments of Val’anyr are like the old shards of Atiesh from level 60 Naxxramas; gather 40 to form the weapon. Needless to say, this is going to be heavily sought-after, I imagine. 3.1 Patch Notes: Respec Time! The 3.1 patch notes are out, and you can read them here on MMO-Champion. I’m not going to reprint them in their entirety, but! There are a couple of things of interest to holy paladins in particular. Auras will now persist through death. Blessing of Kings is now trainable at level 20. Removed from talent trees. New Talent Divinity:Tier 1 protection talent, increases healing done by and to you by 1/2/3/4/5%. Sacred Duty (Protection) rank 1 now increases Stamina by 4%. Benediction (Retribution) now affects Hand of Reckoning. Fanaticism reduced to 3 ranks for 6/12/18% bonus and 10/20/30% threat reduction. Repentance no longer resets the Paladin’s melee swing timer. Righteous Vengeance reduced to 3 ranks for 10/20/30%. Well, isn’t that interesting? That Tier 1 talent, Divinity, looks like a must-have for holy paladins – why wouldn’t you want an extra 5% healing done? For paladins who’d previously taken Kings, it’s an easy switch – for the rest of us, it means giving up a delicious 3% crit from the Retribution tree. Goodbye, Sanctified Seals – I’ll miss you! Glyph of Holy Light: Can no longer crit and has had its range updated. Obviously, it’s early days yet, and this is all subject to change anyway; I will, of course, keep you all informed. Blizzard have finally released information on the dual specs feature talked about for months. You can read the full Q&A on the official site; here are some of the highlights, with my reactions. Nethaera: Who will be able to use it? Ghostcrawler: Players who have reached the maximum level will be able to set up dual specs. Nethaera: Why do players need to be max level in order to do this? Ghostcrawler: We didn’t want to burden lower-level players with extra complexity as they’re working to level up and learn their class. But if the feature proves popular we might consider expanding it. Frankly, I hope they do expand it; it’d be tremendously useful to be able to have a DPS spec and a tanking or healing spec while levelling. Nethaera: How will you be able to set up a dual spec? Ghostcrawler: Players will be able to visit their trainer and pay a one-time fee to be able to use it. Nethaera: How do you switch between specs? Ghostcrawler: Players will be able to switch between their talent specs by visiting any Lexicon of Power provided they’ve paid for the ability to have a secondary spec. Lexicons of Power will be available in major cities, and inscribers will also be able to create a new item that summons one. Anyone can purchase this item, but it requires a ritual of several players to summon it for use by the party. It’s similar to a repair bot in that it will exist in the world for a short duration. It’s important to keep in mind that you will not be able to switch specs while in combat or Arenas. While you won’t be able to switch your spec without the Lexicon, you will still be able to look at your secondary spec whenever you want to. Nethaera: Will solo players have the ability to switch their specs outside of the cities or will they still need to visit a Lexicon of Power? Ghostcrawler: Solo players will still need to go into the city to visit the Lexicon of Power to switch their talent spec or will need to get together with other players to summon one in. Okay, that’s a pretty awesome way of handling it. I’ll be interested to see whether the item used to summon a Lexicon requires a Scribe to use it – will raids need to take Scribes for Lexicons in the future, in the way they need an Engineer for Repair Bots now? My guess is yes. Nethaera: Can I respec only one of my talent sets, or will I need to respec them both if I reset one? Ghostcrawler: When you reset your talents, it will look at the spec you currently have in use as the talent set you want to change. Excellent. I’d been wondering how they were going to tackle multiple specs for those people for whom two regular specs isn’t enough. You’ll still have to fiddle about with the manual respecs when you go to and from your third spec, but at least it’ll be a simple process. Nethaera: Will players be confined to only setting up two specs? Ghostcrawler: We will be launching the feature with just two specs, but depending on how we feel it works out, we might consider additional specs in the future. Speaking as someone with about five specs to choose from, I hope they decide to add more. Nethaera: Will you be able to switch gear easily to match your spec? Ghostcrawler: At the same time we implement dual specs, we will also be setting up a gear system. The feature is called “Gear Manager.” It can also be used to just swap weapons or trinkets or put on that tuxedo to strut around town. It will not automatically switch your gear when you change your talent spec, but it will allow for an easy gear change between them. The feature may not be fully functional immediately in the PTR, but we’ll have more information to share about it before too much longer. Hello, in-game ItemRack! ItemRack’s one of my ‘can’t live without it’ addons; this might relegate it to a nice optional extra, or replace it altogether. Nethaera: Will you be able to change your Glyphs as well? Ghostcrawler: Glyphs will be tied to each talent spec so that if you switch between them, so too will the Glyphs. You’ll notice the UI will have changed a little bit so that the Glyph panes show up alongside the Talent panes now that they are associated. Nethaera: What about hotbars? Will players be able to save them for the talent spec they’re running? Ghostcrawler: Yes, you will be able to save hotbars and use them with your talent specs. It just saves your bars at the same time as it saves the glyphs and talents. If you want to switch to your other action bar, you will need to change specs. 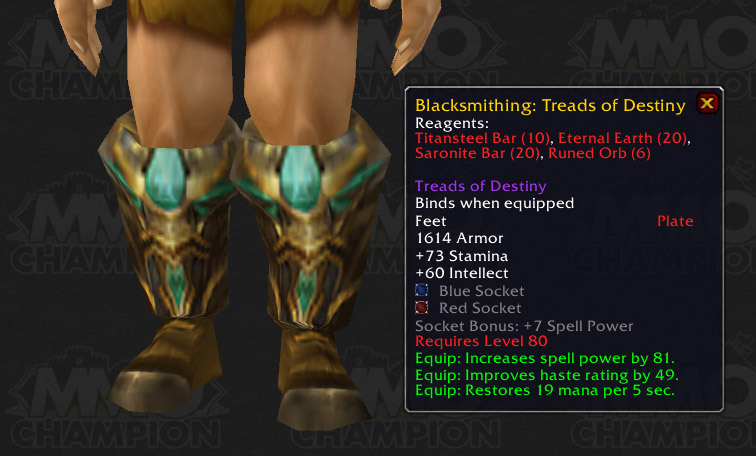 Five bucks says this breaks every hotbar addon in heinous ways. Most of the addon authors will no doubt be all over the PTR getting their addons ready for the changeover; I hope the author of my bar mod of choice (Macaroon) does the same. Nethaera: Is there a way for players to choose their talents without them being saved? Currently, once you spend your talent point, it’s spent unless you pay the respec cost again. Ghostcrawler: With the dual spec feature, we are going to allow players who respec to configure all their talents before they get saved. They will be able to allocate the points, then choose if they want to use that as their spec, rather than needing to carefully diagram out their talents ahead of time. This will allow players a little more freedom when deciding on the talents they want to pick and avoid costly mistakes.